Those who are addictive to drinking shouldn’t exceed two drinks in men and only one drink is allowed for women in a day. This is only, because women are normally smaller and have less production of gastric alcohol dehydrogenase in their stomach, than in men. That’s why men can adsorb more alcohol than women. In a similar way, many people shouldn’t drink at all, such as a pregnant women is even not allowed to drink or taste any alcohol, anyone having history of serious complications arises because of alcohol consumption. All those who are not at risk of taking alcohol and consume alcohol within limits are also not at risk of developing hypertension. Furthermore, the beneficial effects of alcohol predominate in those individuals, who are not at risk. To reduce the risk of developing hypertension, reducing blood pressure and other alcohol related problems, anyone who drinks must be encouraged to cutoff alcohol consumption or reduce it. It is matter of fact, that those individuals who use to drink one or two drinks in a day are not alcohol dependent, and they can easily cutoff their alcohol consumption. In the PATHS trial, outstanding results were achieved by cutting down the alcohol consumption from 6 drinks in a day to 1.5 drinks in a day. During the trial period, intervention group also reduces their alcohol consumption from 2.3 drinks per day to 2 drinks per day. Hence, total alcohol reduction was 4 drinks per day. It was concluded, that all those individuals, who are at severe risk of developing hypertension due to alcohol consumption can easily reduce their alcohol consumption by PATHS trial. It is highly recommended, that all hypertensive patients must be asked about their alcohol consumption, which might include the frequency and quantity of alcohol. Those who drink heavily must need to pass through screening for alcohol dependence, like CAGE questions. Additionally, the techniques adopted by PATHS can be used such as cognitive behavioral technique, which are known to be very fruitful in getting rid of alcohol consumption. 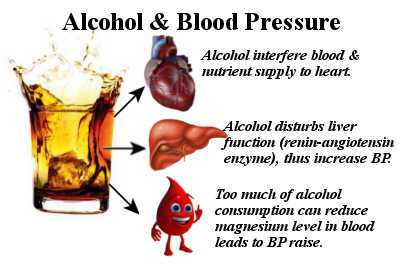 The best one can do is, to visit the alcohol treatment specialist, if hypertension is caused due to alcohol consumption. In this course the health care provider must ask about the daily alcohol consumption and its effect on your body, which may cause hypertension. 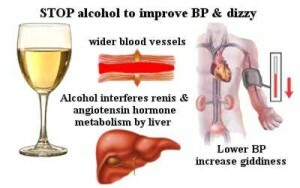 The reduction in BP with reduction in alcohol drinking must be monitored on regular basis and daily checkup is mandatory, and then comparing the results with changes in life style. The reduction in alcohol intake must be followed by weight loss and reduction in the sodium intake are some of the factors which helps in minimizing the hypertension. It is common observation that excessive alcohol causes anxiety, the reason might also be the increase in weight, so if cutting down alcohol is followed by the reduction in weight loss then you can easily say that you are indirectly cutting down risks of developing hypertension.